It’s my pleasure to have you visit the blog today and share the New Year’s traditions with us…now, if only I could taste that scrumptious food! I’d send your share over if it were possible. How fascinating, Devika. I love the way the customs are tied into the actual astrological moments. Imagine the power of all the people performing the rituals and acts at the same time. Thanks for sharing this. I’m glad you enjoyed reading it. Sri Lankans are very big on astrology. Some of it is so confusing that it blows my mind. *lol* I think that warrants another article one day… all the imaginable and unimaginable things where they feel the need to consult astrology. Great knowing about the customs that you follow Devika, we have the same during Diwali. Thanks for stopping by, Ruchi. Yes, Diwali has some similarities to our New Year. 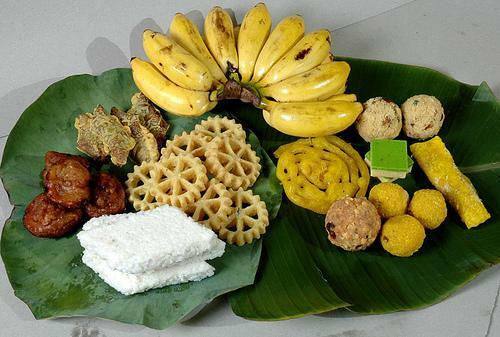 Though we Tamils celebrate New Year on April 13/14, depending on the calendar as you have mentioned, the rituals in Sri Lanka seem so similar to what we have during Pongal (Makar Sankranti) which happens on January 14/15, to celebrate a successful harvest. It is celebrated grandly over 4 days in Tamil Nadu. Ah yes, I know about Thai Pongal, Tamils in Sri Lanka celebrate it in January.